An ingrown hair is a hair that has curled around and grown back into your skin instead of coming through like it should. Ingrown hairs tend to irritate the skin: this makes them easy to spot. An ingrown hair will often leave a raised red bump (or a group of bumps) that looks like a blemish. They can be painless little red things or they can be unbearable sores. A strong sign that you have one is if the area is itchy or uncomfortable. Depending on your skin complexion and the thickness of your hair, you could either see a little pus under the redness or even the hair trapped hair itself. Dead skin cells: Skin cells remain on your skin and can block hair follicles from growing outward instead they grow sideways under the skin.Shaving, waxing and Epilating: Shaving cuts the hair very close to the skin, so the edge is more likely to get caught instead of growing correctly due to sharpness.Tight clothing: The fabric of your clothes cause friction and puts pressure on your hair to curl back instead of growing upwards naturally. Do not tweeze ingrown hairs or razor bumps. Tweezing tears the hair papilla in the skin from which the hair grows, damages the skin and can cause scarring. Should I try extracting an ingrown hair? No. It may damage the skin and can cause scarring or PIH (post inflammatory hyperpigmentation). Consult with your skin care provider for professional extraction if necessary. What is the best hair removal technique, if I'm prone to ingrown hairs? Everybody is different. Your skin and hair will react to certain hair removal methods differently. Waxing is one of the best ways to temporarily remove unwanted hair. It is more effective than shaving because it removes hair from the roots, not just from the skin’s surface. Over time, hair in waxed areas regrows lighter and more sparse, or not at all. What does Bare Boutique offer for treating/ Preventing ingrown hairs? 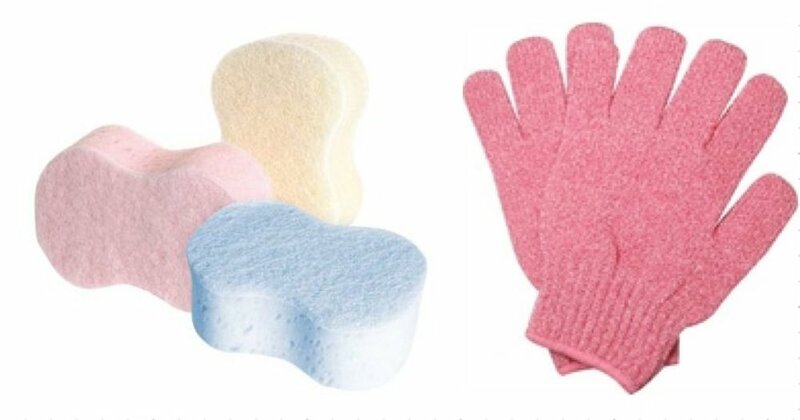 Exfoliating gloves- These gloves flake away dead skin cells leaving a smooth soft canvas for moisturizer to enhance your body's natural glow. We recommend you start exfoliating for two days after your waxing service and then exfoliate at least once a day. Buffing Sponges- The coarsely textured surface of our Buffing Sponge is designed for serious exfoliating, priming skin to be moisturized. We recommend you start exfoliating for two days after your waxing service and then exfoliate at least once a day. Image SkinCare Clear Cell- Salicylic Clarifying Pads- A salicylic/glycolic acid skin pad to effectively remove impurities and excess oil. Deeply clears clogged pores and follicles to leave skin fresh and clean. A blend of antioxidants and calming ingredients reduce acneic inflammation. Paraben free. Take out one pad at a time and apply by gently rubbing on the affected areas. If going outside, use a broad spectrum sunscreen. Because excessive drying of the skin may occur, start with one usage daily, then gradually increase to two or three usages daily if needed or as directed by your skin care therapist. If bothersome dryness, irritation or peeling occurs, reduce usage to once a day or every other day. Tend Skin®: Applying Tend Skin® Liquid regularly to areas that are waxed will reduce the appearance of ingrown hair formation that occurs after the procedure. When used before waxing, it makes the hairs adhere to the wax much better due to oil removal and protects the skin from hot wax burns due to wax sticking to the skin. When applied after waxing, Tend Skin® Liquid reduces the appearance of any redness so the skin is often clear before you leave Bare Boutique. Avoid using Tend Skin if you have an allergy to aspirin or pregnant and/or nursing.